John Burley Swainson was born in Canada in 1925 and came to Michigan with his family when he was two years old. He fought with the 95th Infantry Division of the United States Army during World War II, losing both his legs to a land mine explosion in France in 1944. 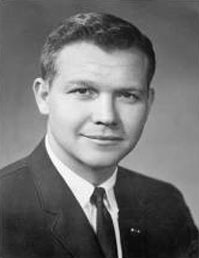 After earning his law degree in 1951, Swainson was elected as a Democrat to the state senate and served there from 1954 to 1958, as Lieutenant Governor from 1958 and 1961, and as Governor from 1961 to 1963 after his election in 1960. He was defeated in the 1962 election by Republican candidate George Wilcken Romney (father of future Massachusetts Governor Mitt Romney). After leaving office, Swainson served as a circuit court judge and State Supreme Court justice, the latter from 1971 to 1975. It was in 1975 that Swainson was accused of bribery conspiracy and perjury after John J. Whalen, a burglar convicted in 1970, said he had arranged for a $20,000 bribe for Swainson to influence other high justices to order a new trial. Whalen brought these accusations to the attention of the Federal Bureau of Investigation in 1972, and even carried a concealed microphone while meeting with Harvey Wish, a bail bondsman also indicted in the incident and later convicted of bribery conspiracy. Wish was accused of being the intermediary through which the bribe would be funneled to Swainson. Though Swainson was cleared of the bribery charge, he was found guilty by a jury on November 23, 1975 of three counts of perjury. He served 60 days in a minimum security prison, and lost his law license for a time. The U.S. Court of Appeals upheld the conviction after Swainson appealed on the argument that the taped conversations between Whalen and Wish had influenced the jury's decision. Whalen, who had begun informing the FBI on other matters including a Detroit fencing operation in which 13 people were arrested, had a rather rough time of things after Swainson's trial. Arsonists destroyed his home less than a week after the verdict, and in December of 1975 he was kidnapped, tortured, and shot by two men; he lived to tell the tale. Swainson later became the president of the Michigan Historical Commission, a title which he held until his death of a heart attack in 1994. Two years later, the Commission established the Governor John B. Swainson Award to recognize "state, county, or municipal employees who have contributed to the preservation of Michigan history even though such activities are not part of their primary job responsibility."